Deciding to put on a colored wedding dress is without a doubt one big move. It's an inevitable fact that the highest expectation out of a bride's look is her dress. Thus, slipping on a non-traditional wedding dress might, well, make it or break it. To help you decide, we gathered our picks for colored wedding dresses beautifully presented by celebrities on their big day. Last weekend, all eyes were on the Monaco’s fairy-tale wedding of Pierre Casiraghi and Beatrice Borromeo; where the lovely bride wore a romantic soft-pink Valentino dress to exchange sacred vow with her blue-blood beau. We also love how the Italian aristocrat styled her hair in a modest down-do and a somewhat-rustic flower band to complete her silk-chiffon dress. It was the perfect mix of elegance, bohemian chic, and modern-day princess. Being famous for her role as pink-lover Elle Woods, the American sweetheart decided to tie the knot clad in a wedding dress that seems to pay homage to her character. Reese looked stunning in a blush-pink Monique Lhuillier gown with a sash and corset top on the day she wedded Jim Toth. After a one-year engagement, Anne Hathaway finally tied the knot with Adam Shulman and boy, did she do it with style. Anne simply looked flawless in the Valentino’s masterpiece. The dress had a subtle ombré style and Anne styled it with a lace headband and cathedral veil. So chic! Another star, another blushing bride. Actress Jessica Biel said “I do” to singer-actor Justin Timberlake, flaunting off a custom Giambattista Valli Haute Couture petal pink gown. “It was a leap of faith, but it turned out better than I could have ever imagined, I felt like I had made the right choice,” she said. 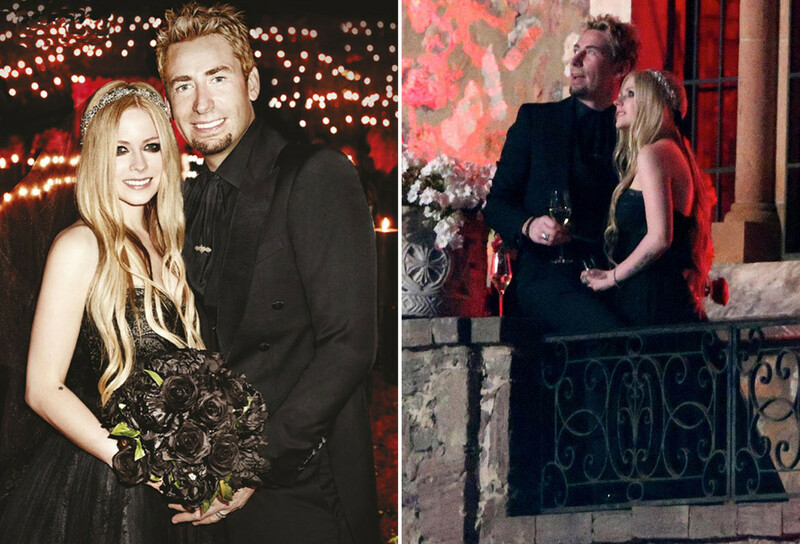 The singer went brave and bold with her wedding dress color, just as expected. It was a Christian Dior creation designed by John Galliano that sported a hot pink color, suitable for Gwen’s lively personality. It’s so pretty, and the dress is now showcased in the Victoria and Albert Design Museum in London as a piece of art. One more in the pink team, is Jenna Dewan-Tatum. Her custom Reem Acra dress definitely won us over. The strapless dress had a sweetheart neckline along with a pink feathered skirt which she paired with a long veil and a pair of Neil Lane earrings to complete the look. Moving on from the sweet and feminine pink, the extraordinary black dress now hits the spotlight. Shenae Grimes had on a black Vera Wang wedding dress on the day she wedded British Model, Josh Beech. She was also pictured holding a red-tainted bouquet, a perfect dramatic compliment to her dress. We always have such high expectation for SJP’s fashion-forward style and she seems to deliver everytime. Although she wore a majestic white dress as our beloved Carrie Bradshawfor her nuptial in the movie, the actress opted for a textured Morgan Le Fay black gown for her own wedding with fellow actor Matthew Broderick. 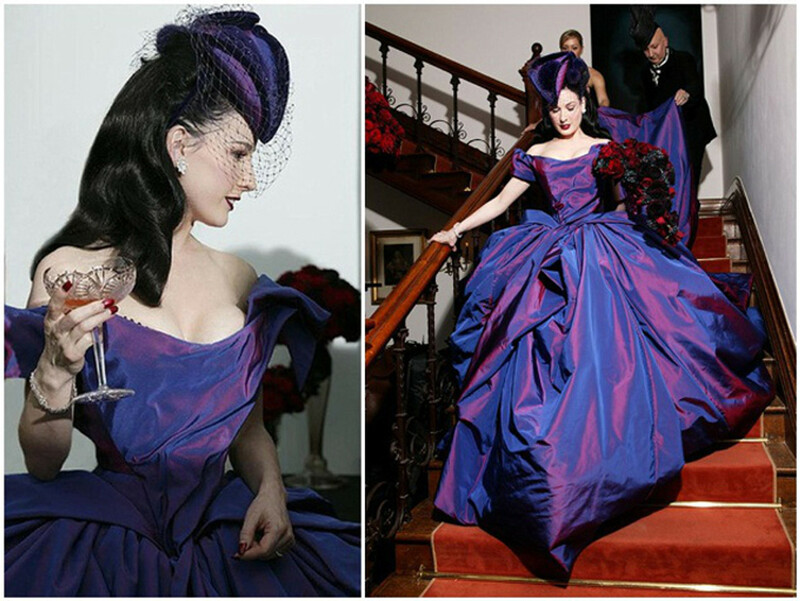 The sultry pin-up personality pushed her boundaries by putting on this extravagant purple dress, custom made by Vivienne Westwood, on her union with rock star Marilyn Manson. With a hat, bird-cage veil and a cascading red rose bouquet, it’s for certain that her look would be unforgettable.